A couple months ago I found an interesting puzzle for Mickey to do. 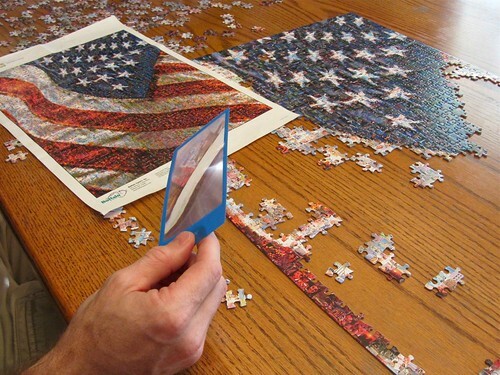 You know he loves his puzzles and he's very patriotic. He started it several weeks ago. It's on the dining room table which we don't use that much but we did have to transport the puzzle elsewhere once or twice when we had company for dinner. It has been waiting to be finished. (I've been waiting for it to be finished too. I like the not-so-beautiful table to have a table cloth.) Mickey started working on it again last night and today. He's having trouble figuring out where the pieces go. I don't see what his problem is. I don't think it looks that hard. Look closely at the pieces. The puzzle is made up of hundreds, probably thousands, of pictures. He found this little magnifying thing today. He was hoping it'd help him with placing the pieces. It's not as good as he had hoped but it has helped some. This has been one of the most challenging puzzles I have ever worked on. I believe that, or at least that is what I am telling myself, is why I didn't work on it for so long. I am now making progress. It will be spectacular when it is done. By the way...this is post number 1200! Wow this blog is old.